The Bone Collection Link II Mini USB Type 'B' (5-pin) USB plug-Compatible with all USB devices such external hard drives, digital cameras-This high quality USB 2.0 cable (A to Mini B) provides one (4-pin) USB Type A male connector and one Mini B (5-pin) male connector, and can support data high speed USB 2.0 transfer rates of up to 480Mbps. Expertly designed and constructed of only top quality materials, the A to Mini B USB 2.0 cable provides pure digital data transfers for sharper, more natural images and sound at higher speeds. 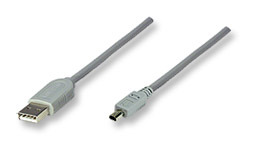 This cable cab be used as a high quality replacement for connecting your digital camera (Canon, Sony, Hewlett Packard) to a host computer, this USB A to Mini B cable also delivers a cost-effective way to maximize the file transfer performance of your MP3 player, PDA, or digital camcorder. • Flexible & Bendable design, it is tiny design, easy to carry and space saving, the cord is short and is easy to store. • High-quality parts are used for connectors and wires, providing quality data transmission. The Digitech USB TO Mini USB Cable – USB Sync / Transfer Data & Charger Cable- Type A to Mini B) provides one (4-pin) USB Type A male connector and one Mini B (5-pin) male connector, and can support data high speed USB 2.0 transfer rates of up to 480Mbps. 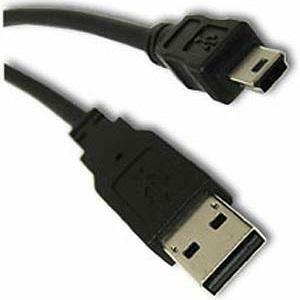 -A high quality replacement for connecting your digital camera (Canon, Sony, Hewlett Packard and Panasonic ) to a host computer, this USB A to Mini B cable also delivers a cost-effective way to maximize the file transfer performance of your MP3 player, PDA, or digital camcorder. -Connect your cell phone to your PC/Laptop to access and synchronize your phone book contacts, e-mails, and appointments, change ring tones and background pictures, take advantage of other useful applications! • USB Type A male to USB Mini 4-pin male. • Connects a USB device to a USB hub or computer. • Speeds of up to 480 Mbps. • Hi-Speed USB 2.0 for ultra-fast data transfer rates - with zero data degradation.